The Doctor is constructing a minimum inertial superdrive for Bessie when a message container from the Time Lords appears. It will open for only one person and so the Doctor and Jo enter the TARDIS to deliver it. They arrive on Skybase One in orbit around the planet Solos in the 30th Century Empire of Earth. Also on the Skybase to attend a conference are a party of Solonians led by the warrior Varan (James Mellor) and Ky (Garrick Hagon), leader of a rebel faction. 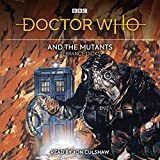 As the visiting party are taken through decontamination, Varan's bodyguard (Steve Ismay) is revealed to be in the process of transforming into a mutt - a Mutant creature - and is killed. The Marshal (Paul Whitsun-Jones) in charge of Skybase One learns from an Earth Administrator (Geoffrey Palmer) that the authorities intend to make Solos independent - Earth rule is to stop. The Marshal is horrified as this will mean an end to his career and so he plots to have the Administrator assassinated. The Doctor and Jo are found by two guards, Stubbs (Christopher Coll) and Cotton (Rick James). They are taken to the Marshal and the Administrator but the message container won't open for either. The Doctor suggests that he attends the conference as it is most likely intended for someone there, but the Marshal refuses. The Doctor escapes from Stubbs and heads for the conference. Varan's son (Jonathan Sherwood) kills the Administrator and in the confusion, Ky rushes from the room. He bumps into the Doctor and the container starts to open - the message is for him. Jo runs after him and ends up being taken hostage and transported to Solos. Ky takes her to a cave system as the air on Solos is poisonous to humans during daylight. The Marshal wants the Doctor to force open the container. The Doctor has no choice but to agree as he needs the Marshal to find Jo. He is introduced to Professor Jaeger (George Pravda), in charge of experiments to change the planet's atmosphere to one breathable by humans. The Doctor builds a particle reversal system to try and see inside the container. Meanwhile the Marshal kills Varan's son, and Varan escapes into the Skybase, hiding in the herbarium. The Marshal orders his death, claiming that he has turned mutant. The Doctor asks to be allowed on the hunt and the Marshal agrees. Jaeger tells the Marshal that with the Doctor's help he can get the atmospheric experiments completed in a week. The Doctor and Stubbs find Varan and realise that he has not mutated. Varan tells them what he knows and they agree to help. The Doctor engineers a power failure so that he and Varan can escape to the planet's surface. Jo and Ky are confronted by insectoid Mutants (Laurie Goode, Bill Gosling, Nick Thompson Hill, Mike Mungarvan, Ricky Newby, John Scott-Martin, Eddie Sommer, Mike Torres) in the caves. As Ky tries to fend them off with a flaming torch, Jo runs deeper into the cave system. She finds a glowing cave and sees a radiation-suited figure but then collapses. The Doctor and Varan enter the caves and help Ky fend off the Mutants. The message container opens to reveal a number of tablets marked with ancient Solonian hieroglyphs. Varan returns to his people while the Doctor and Ky try to find Jo. The Marshal intends to flood the caves with gas and to seal the exits. Stubbs and Cotton enter the caves to try and find the Doctor, but the Marshal seals them in also. The Doctor and Ky find Jo and are joined by Stubbs and Cotton. They then see the same figure that Jo saw gesturing to them. It leads them to a lead-lined room and is revealed to be Professor Sondergaard (John Hollis), who has been investigating the history of Solos. He believes that the changes to the planetary environment and to the Solonians were natural at first, but that Jaeger's experiments have accelerated the process. The Doctor sends Jo off with Stubbs, Cotton and Ky to get to the surface while he stays with Sondergaard to try and translate the tablets. They work out that the pictures show a cycle of some sort and in the radiation cave the Doctor finds a strange crystal. He realises that the Solonians are meant to mutate every 500 years. He must get to the Skybase to analyse the crystal properly. Varan, who has now started to mutate himself, has rounded up what remains of his people and captures Jo, Stubbs, Cotton and Ky as they leave the caves. They intend to storm Skybase. The Marshal has meanwhile been told that an Earth Council Investigator (Peter Howell) is arriving on the Hyperion. He determines that Jaeger will have changed the atmosphere of Solos by the time the Investigator arrives. Varan's party invade Skybase as Jaeger prepares to launch his atmospheric ion rockets. The Marshal ambushes them and Varan is blown into space through a hole in the hull. The others are taken prisoner by the Marshal. He intends to execute Ky and Jo but when Jaeger informs him that the experiment was a total failure - all the ion rockets hit the planet rather than exploding in the atmosphere - he decides to keep Jo alive as a guarantee of the Doctor's co-operation. Sondergaard stays on Solos while the Doctor returns to Skybase. The Time Lord agrees to help the Marshal as Jo is held hostage, and intends to use a component from the transfer system to clean up the contaminated areas on the planet's surface. Jo escapes and is able to alert the Hyperion of the problems before Stubbs is killed by the Marshal. The Marshal has Jo, Cotton and Ky taken to the radiation chamber where they will be killed by thaesium radiation as the Hyperion re-fuels. The Doctor's plan works and Solos is decontaminated. He is then pressured into assuring the Investigator that all is well. Jo, Cotton and Ky escape from the radiation chamber and burst into the meeting. The true story starts to unfold but the Marshal continues to assert that the Mutants are diseased and must be wiped out. Sondergaard has communicated with some mutants on the planet and, when he transfers to the Skybase, one follows him. It too disrupts the meeting and the Marshal takes the opportunity to press home his point, killing the Mutant. He has Cotton and Ky returned to the irradiated radiation chamber. In the confusion, the Doctor and Sondergaard analyse the crystal in Jaeger's lab and realise that it acts as a biocatalytic agent. The crystal must be taken to Ky. Conveniently, the Marshal has Sondergaard and Jo placed in the radiation chamber. Ky is given the crystal and transforms rapidly, first into an insect creature, and then into a glowing super-being. The Doctor manages to sabotage Jaeger's final atmospheric experiments and Jaeger is killed. Ky releases Jo and the others from the radiation chamber and flies through the Skybase, killing the guards, until he finds the Marshal whom he disintegrates. Sondergaard decides to stay on Solos to help the Solonians fulfil their destiny while Cotton looks forward to returning to Earth. Their job completed, the Doctor and Jo leave in the TARDIS.